1221 Spofford Avenue. Credit: Body Lawson Associates and WXY Architecture. Photo via the Wall Street Journal. The buildings will range from roughly 10 to 15 stories. All of the residential units will be designated as affordable housing. There will also be 21,000 square feet of retail space, 48,000 square feet of community facility space, and 49,000 square feet of light industrial space, the Wall Street Journal reported. Architecture firms Body Lawson Associates and WXY are designing the project. It will be built in phases and is expected to be complete by 2024. 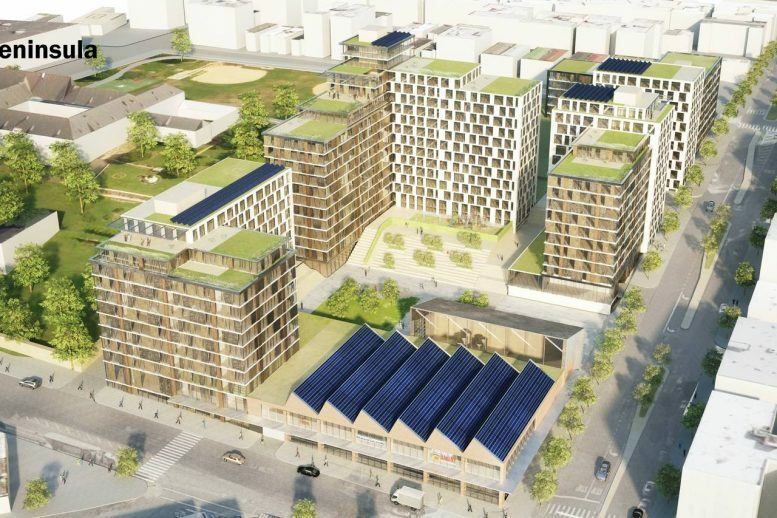 3 Comments on "Five-Building, 740-Unit Mixed-Use Project To Replace Detention Center At 1221 Spofford Avenue, Hunts Point"
News of five-buildings spread all over website on YIMBY, sudden living in the property for residential. Great idea looking forward to it. How can I be able to apply for this affordable housing at Spofford? Finally something is being done with the property.